Everyone should read this book! It has a great lessons in compassion, acceptance and friendship for all ages. August (Auggie) Pullman is about to enter fifth grade at Beecher Prep. He's a great kid... fun-loving, intelligent and inquisitive... much like any other fifth grader. Except for one thing. His face is deformed to the point that small children cry and run away when they see him. He's never been to school with other kids before because his many surgeries and medical issues have prevented it. Now he has decided to give it a try. 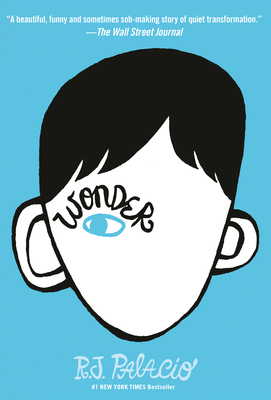 In Wonder we learn about his experience in fifth grade through many eyes, from Auggie, his sister Via, and several of his classmates, and the challenges each of them face. It is a hearbreaking and heartwarming story, I highly recommend it.